Episode 20 – Support Pastor Fritsche, get a Sticker. We have an exciting campaign going on during the month of December. We're looking to support Pastor Joel Fritsche and his work in the Dominican Republic. 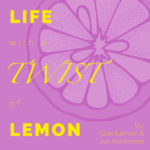 Here's the deal, you donate - send us proof of donating $50 or more and we'll send you a limited edition Life with a Twist of Lemon sticker (3" x 3").